Investigative Post's Daniela Porat questioning Buffalo Common Council President Darius Pridgen after the September 26 meeting of the Council's Police Oversight Committee. Photo courtesy WGRZ-TV. Investigative Post recently announced an event on December 4 that will explore how hostile government officials at the federal, state, and local level have become to the press, and by extension, the public’s right to know. Panelists will include Jerry Zremski, Washington bureau chief of the Buffalo News, Jimmy Vielkind, Albany bureau chief of Politico New York, and Steve Brown, investigative reporter with WGRZ. 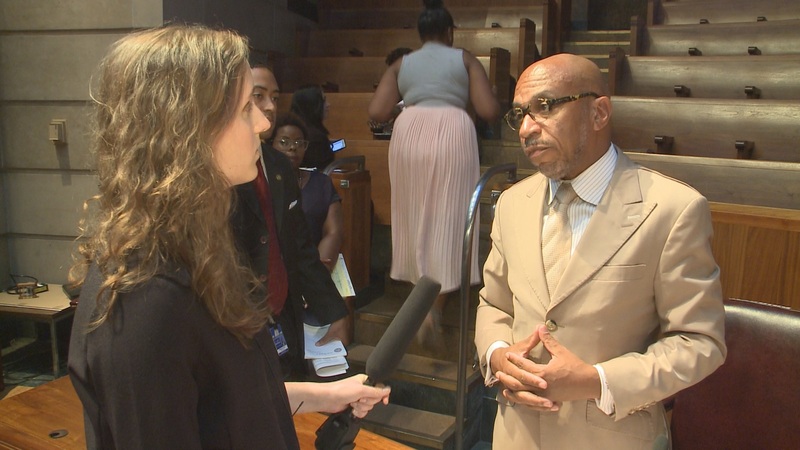 As if on cue, Buffalo Common Council President Darius Pridgen and his colleagues on the Buffalo Common Council underscored that hostility last Friday by announcing steps intended to put reporters in their place. In the process, they made themselves look kind of silly, to say nothing of petty. Why the change? The press release doesn’t say, but we can safely assume it’s at least partly the result of an interview Investigative Post’s Daniela Porat did with Pridgen at the conclusion of a Police Oversight Committee meeting on September 26. Likewise, Pridgen redacted information from the checkpoint reports that should have been disclosed, according to Robert Freeman, executive director of the state Committee on Open Government. So much for the public’s right to know. Which bring us back to the Council’s effort to aid and abet members who want to avoid questions from pesky reporters. There’s not much reporters from any self-respecting news organization can do except ignore the edict, which is what Investigative Post will do. As for our December 4 event, we’ll allow Pridgen and his colleagues to sit wherever they want and ask whatever they want. Just as it should be in Council chambers. Jim Heaney is editor of Investigative Post, a nonprofit investigative reporting center focused on issues of importance to readers in Western New York.